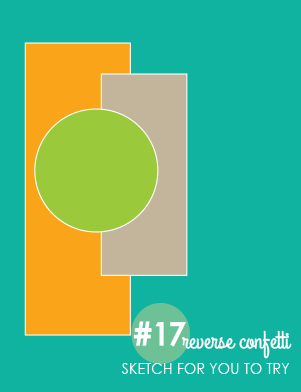 Color Throwdown #316--- love u!! 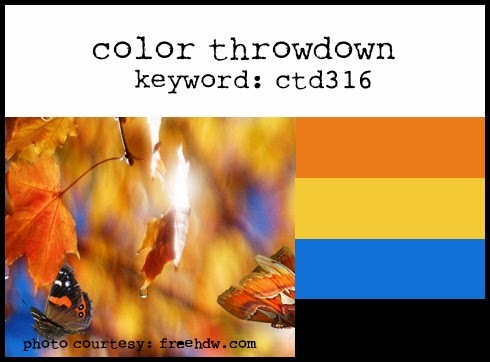 Good Morning... it's Wednesday and y'all know that means it's time for the newest inspiration pic and colors for the Color Throwdown challenge. This week Monika is the hostest! Our Guest Designer this month...Tara Godfrey from Inking on the Edge - this girl knows how to layer and embellish!! 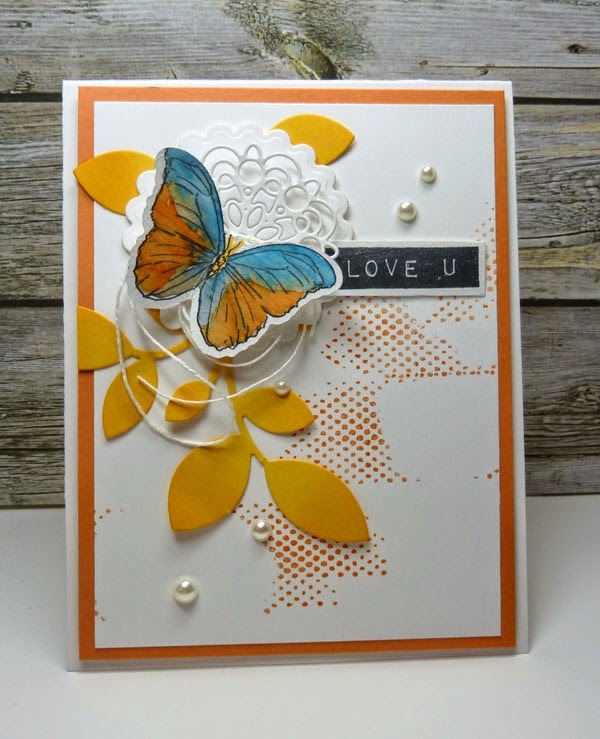 And the featured Stamper this week is Sue Rose.. you can find her blog Sues Stamping Station here. 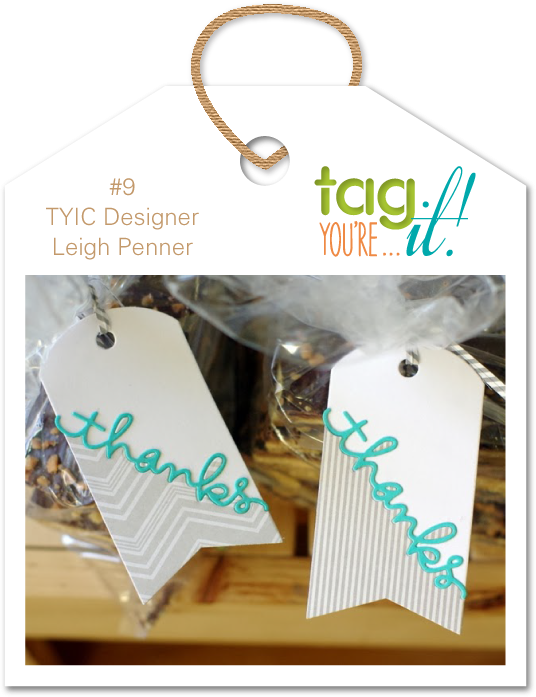 Don't forget to visit the other CTD DT blogs for more inspiration. Remember, if you don't have the exact colors, use whatever you have that's close...this is all about having fun! AND... remember "neutrals" are free! If you upload to a public gallery, please use the key words CTD316 Also, when linking up your card using the linky tool at the bottom of the post, please link to your specific post, not a generic link to your blog. 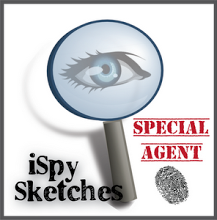 Flip the sketch 90 degrees to the left and imagine that circle element grew!! That's it... now you see. Isn't he sweet and oh, the bowtie is adorable!!! Autumn- Viva la Verve sketch!! 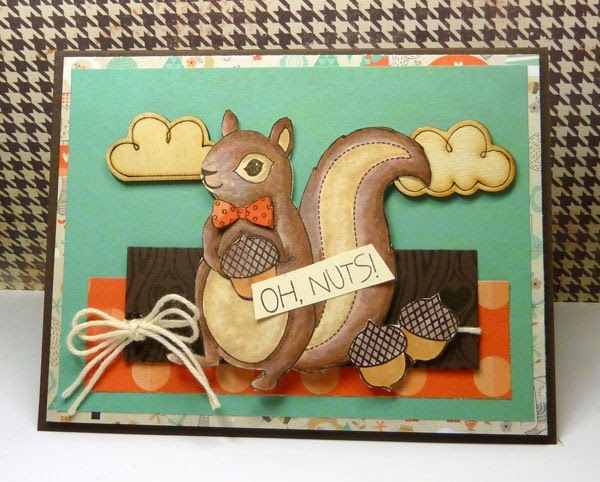 Okay.... worked on this card a while ago for the Viva la Verve Week 1 sketch and the Fall Fantasy Inspiration challenge... well, I missed the Inspiration challenge but, I still had fun!! Used some older Verve sets... Harvest Blessings and Autumn Splendor (retired, I think). The leaves from Harvest Blessings were stamped on Fancy Pants True Friend patterned paper and fussy cut.... took a little liberty with the sketch. The sentiment and outlines leaves are Verve's Autumns Splendor. Happy Sunday!! Hope yours is going well. We have the crockpot going for supper which gave me an opportunity to make this sweet tag. 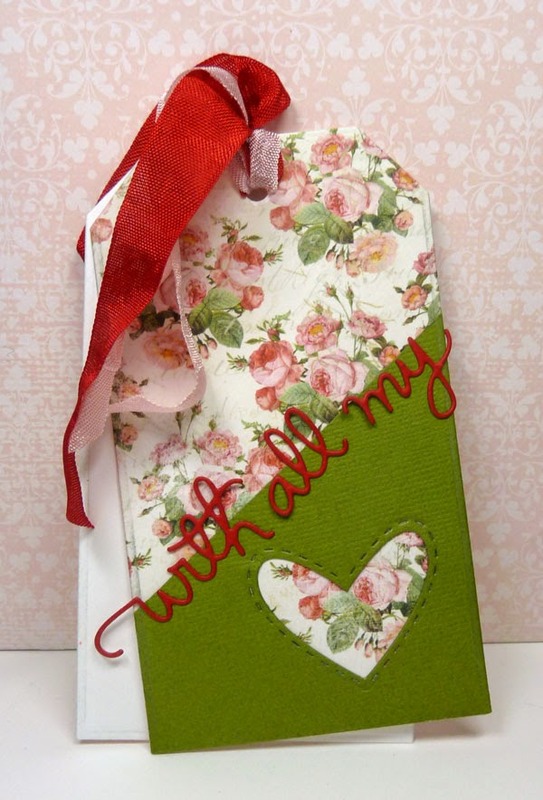 I used MFT's tag dies, Simon Says Stamp "with all my heart" die, and Lil Inkers stitched hearts. 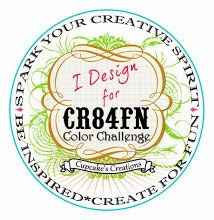 My inspiration came from this week's Tag You're It challenge. Also, playing along with Simon Says Stamp Monday challenge.... Anything Goes!! 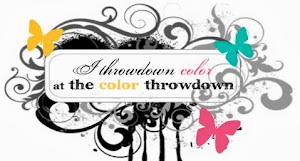 Good Morning... it's Wednesday and time for the new Color Throwdown colors!! This week Jodi is bringing us these fantastic colors!! Isn't that image wonderful.... love those white pumpkins, well I guess they aren't totally white! I wanted to play with pumpkins, like the inspiration picture, so I pulled out my Verve set Bountiful Harvest. The pumpkins were stamped, lightly colored with two shades of yellow copics and red for the stars. I added some leaves with Verve's Sprightly Sprigs die, die cut a circle for the sentiment to nestle in and finished with a twine bow and stars in the corner. Our Guest Designer this month...Tara Godfrey from Inking on the Edge - and as you know by now, this girl knows how to layer and embellish!! 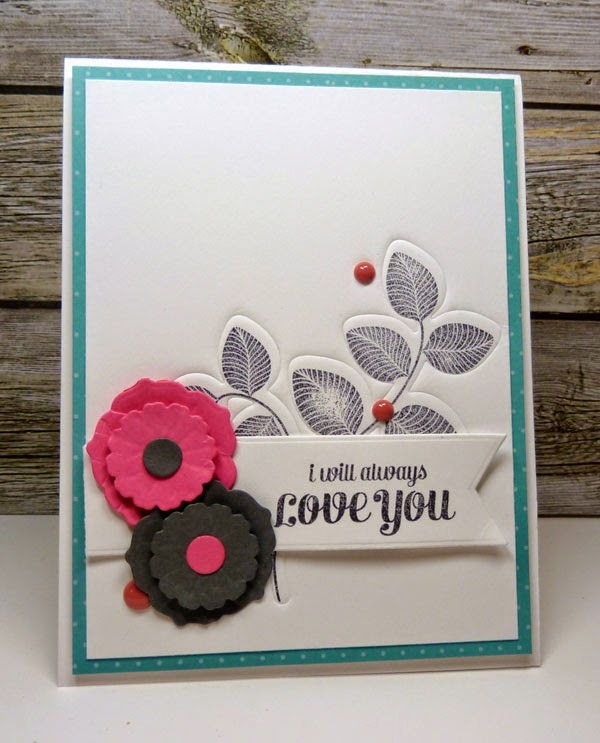 And the featured Stamper this week is Bernadette Bliss... you can find her blog Sweet Paper Bliss here. Remember, if you don't have the exact colors, use whatever you have that's close...this is all about having fun! AND... remember "neutrals" are free! If you upload to a public gallery, please use the key words CTD315. Also, when linking up your card using the linky tool at the bottom of the post, please link to your specific post, not a generic link to your blog. Happy Sunday!! I've been relaxing today... had a little bug yesterday but, feeling better now!! Using this week's Viva la Verve sketch. Haven't had enough of that Coffee die and coffee cups (well, these are actually the teacups) but, I'm a coffee girl so, I made them work for me. 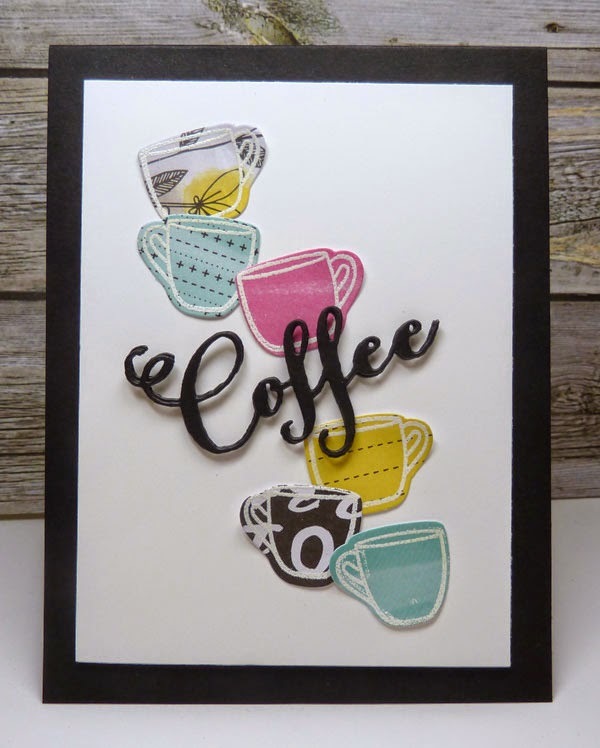 The cups were die cut using Verve's Cuppa Tea dies using different patterns from Amy Tangerine's Plus One PP. I stamped the cups with the outline images- Verve One Cup and heat embossed with white. Added the Coffee die- in triplicate, adhered to each other to add a little dimension. Yay!! Yay it's Wednesday and I am able to post to blogger- have been trying for the past two days via firefox and it wouldn't work- so today I tried google chrome and it worked.....geesh!! Lori picked some wonderful colors for us this week!! I went a bit graphic this week, not normally something I am comfortable with but, this Simon Says Stamp die "Ring Frame" helped.... A LOT!! I diecut it four times- using the white for the base and then added the colored circles. 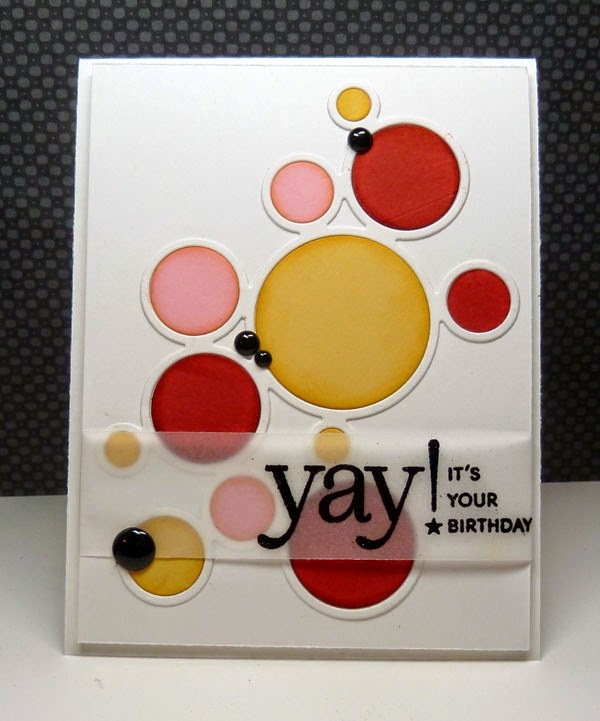 I sponged the outer edge of the circles with corresponding SU ink to add a little dimension. 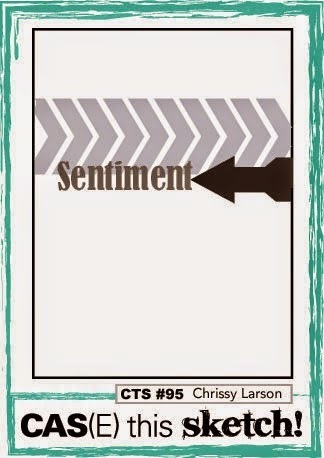 The sentiment is PTI stamped with versamark and heat embossed with black- a few enamel dots finish it off. Remember, if you don't have the exact colors, use whatever you have that's close...this is all about having fun! AND... remember "neutrals" are free! If you upload to a public gallery, please use the key words CTD314. Also, when linking up your card using the linky tool at the bottom of the post, please link to your specific post, not a generic link to your blog. 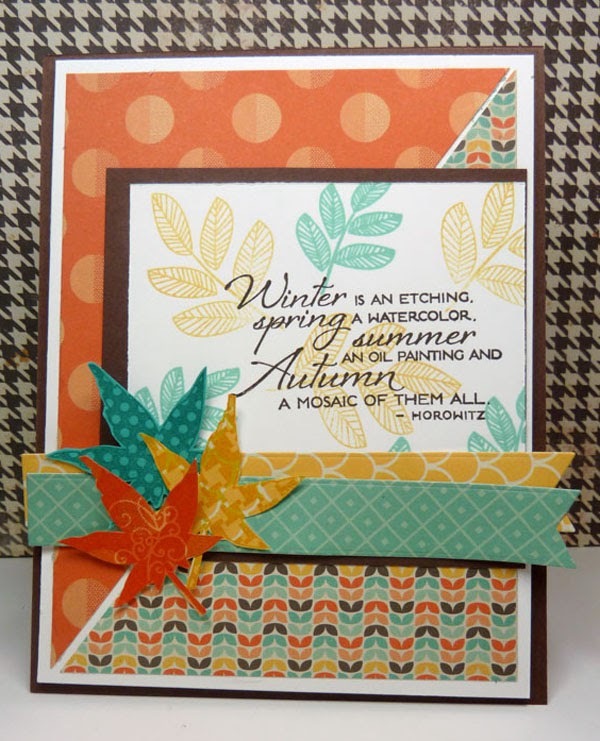 Serendipity Stamps Blog Challenge- Autumn/Fall!! Good Morning! Time for the next post for Serendipity's Challenge Blog. 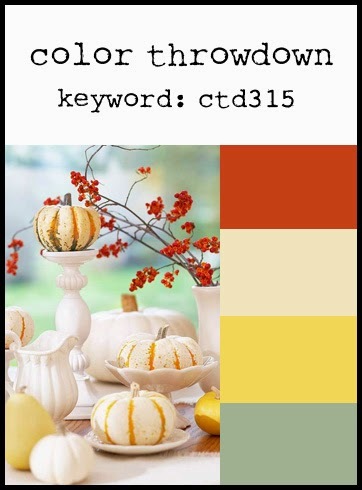 Remember this month is all about fall!! Mary always gives the DT an extra challenge and this time around is Halloween... it'll be here soon!! Oh, I don't have to dress up little ones anymore but, sure had a good time doing them when my girls were little. I do need to be thinking about getting candy for the little ones coming though!! Is that not the sweetest image!!! I love this little kitty with the great big halloween hat!! The image - Fraidy Cat- was stamped on XPress It blending cardstock and colored with copics. Added some wink of stella to the purple tie- hard to get pics. Die cut the Boo three times in different colors and layered- the wisteria wonder layer was sponged with coordinating ink for a little added dimension. 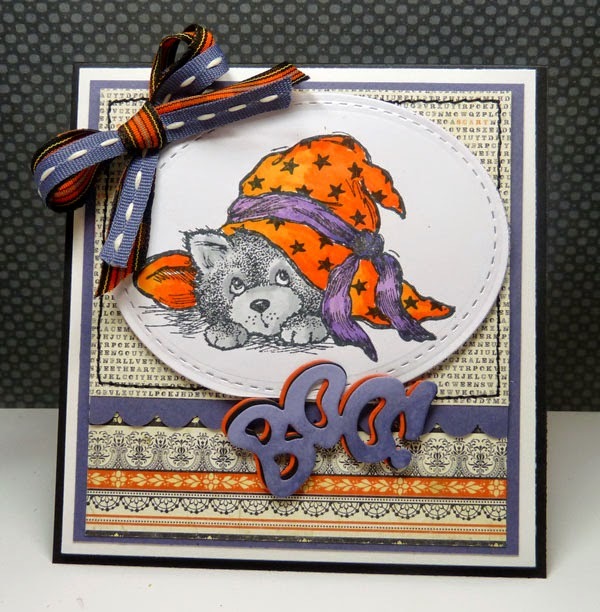 AND... the lovely Julia Stainton is our Guest Designer for October -Thrilled to have you with us!! The rules are simple... play along using at least one Serendipity Stamps image on your submission and the theme of Autumn/Fall. You don't have to have a blog to play along - you can link your designs to any on line gallery. This week’s sale is “Buy 3, Get the 4th Free” good through Oct 22nd. Waltzingmouse Stamps PJ Party- Old Pajamas!! The last and final challenge for the Waltzingmouse Stamps PJ Party- Old Pajamas!! To make a Christmas card using an older set. Used one of my fav sets-- Festive Foliage and the coordinating Pine Cones die set. Made the card in a monochromatic theme. 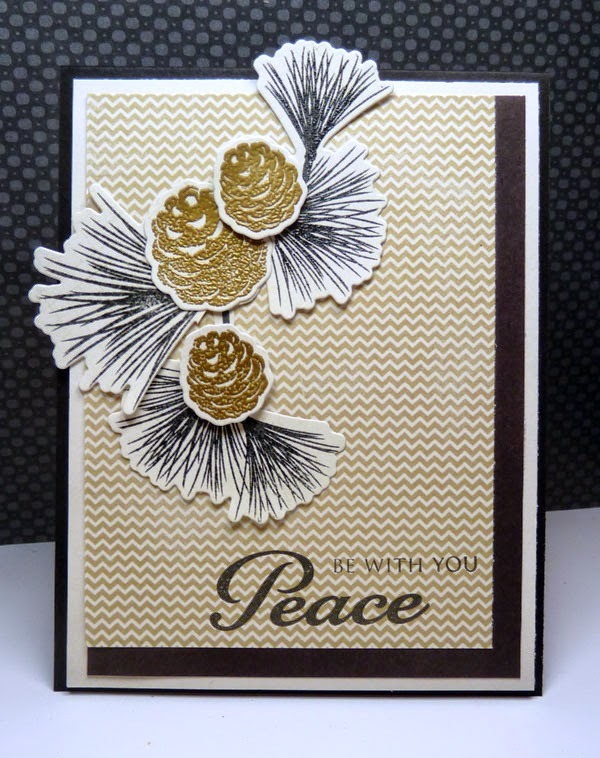 The foliage was die cut, stamped with versamark and heat embossed with black or gold. 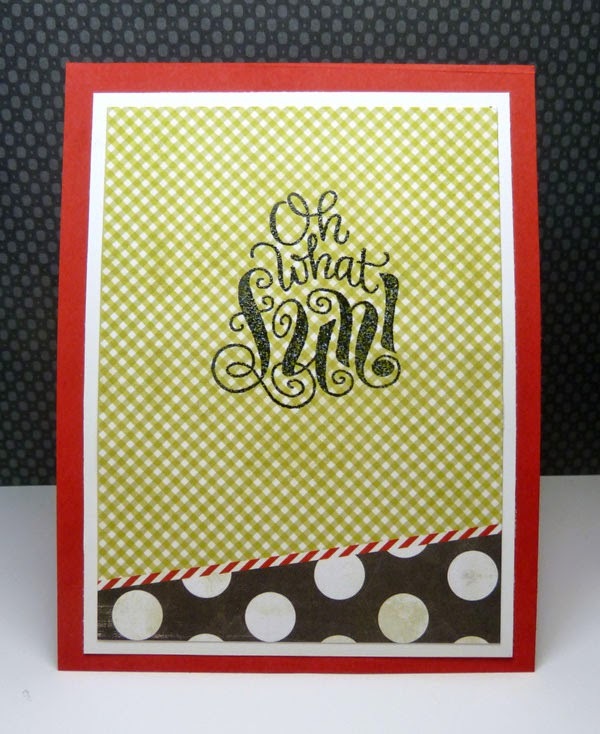 Added a sentiment from Say It Loud Holiday. Waltzingmouse Stamps- PJ Party- Texturise!! Welcome back for another card for the WMS PJ Party!! 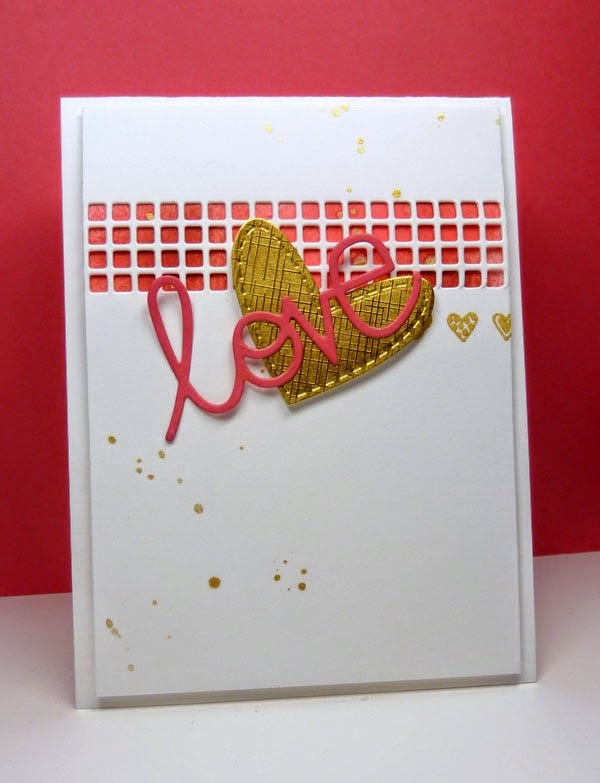 This challenge was to create texture on your card by embossing. I took the Simple Sprig die and by adding the tan mat embossed the outline of the sprig. Then, stamped the sprig image from Sprightly Sprigs but, a little off to see the embossing detail. Added some flowers using the Funky Flowers dies and added dimension to them with a the rounded end of a stylus. The sentiment is from Compact Sentiments- will always be one of my favs. Waltzingmouse Stamps- PJ Party!- Snowflakes! It's time for another Waltzingmouse PJ Party.... wonderful excuse to play with my WMS stamps and dies!!! This card was made for the Snow is Falling challenge. I used the new Waltzingmouse Snowflakes dies 1, 2, and 3 to created layers in different colors. I left some of the pieces in the die for a little added interest. As well, the largest snowflake was not completely die cut so there is a border and the "snowflake pieces" were gently pulled out for added dimension. The background was created with the large Crackle stamp. The sentiment is from Compliments of the Season. Waltzingmouse Stamps PJ Party- Sketch!! Another card for the WMS PJ Party. 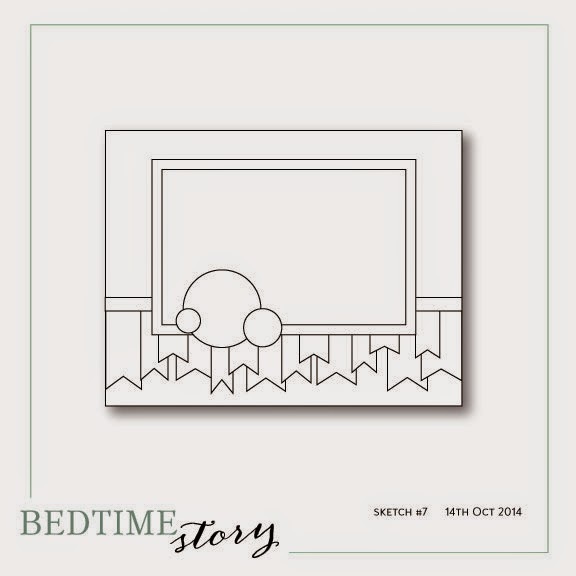 This card uses the Bed Time Story sketch that was provided.... look at those fun banners!!! Still using a Christmas theme. 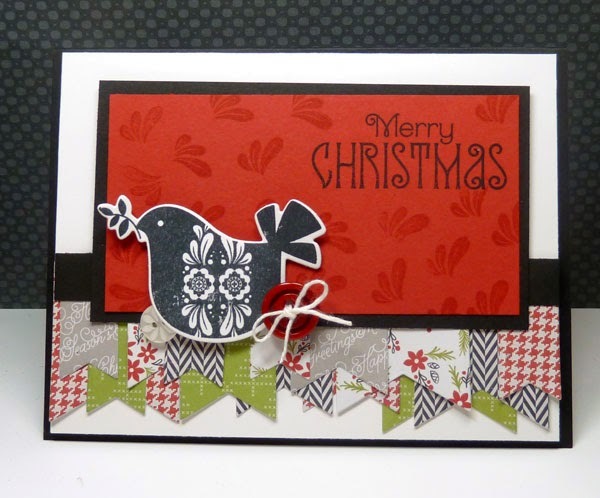 That sweet bird is from WMS Folk Art Christmas Additions and was die cut with the corresponding Folk Art Christmas die. The small flourish from Folk Art Medallion was stamped with versamark onto the red panel. Sentiment is from Folk Art Christmas Additions. Paper is Pink Paislee Merry & Bright. Happy, Happy Friday!! 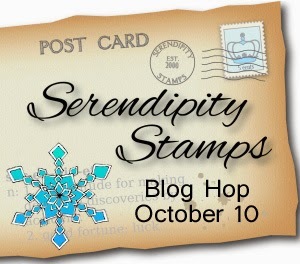 Welcome to the Serendipity Stamps Blog Hop featuring some of the new stamps and dies at Serendipity Stamps. 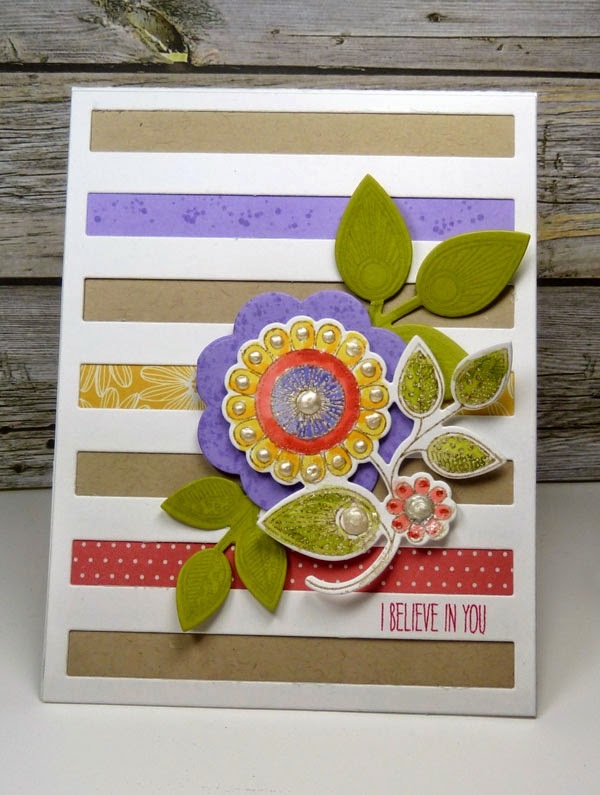 These stamps and dies are available now for purchase... the DT is hopping todayhoping to provide a little inspiration. Today is all about Winter...Snowmen (or women) and Snowflakes!! You should have arrived here from Miriam's blog but, if you happened along or got lost along the way, go to Mary's blog to start the hop or see the link list below. Yep, I have sledded with one of these saucers and loved every minute of it!! 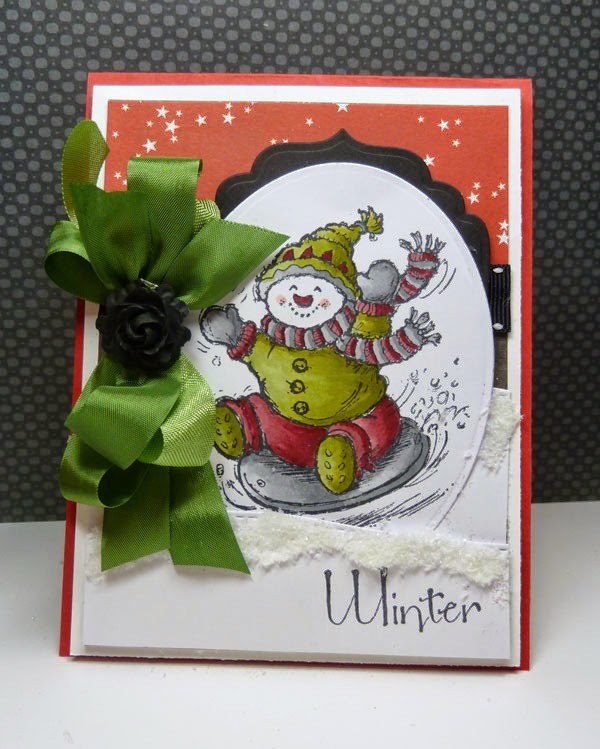 Stamped the adorable image, Serendipity Sledding Snowman, onto XPress It cardstock and colored with copics. Added some flower soft for the hills of snow.The seniment is Serendipity's Spring-Summer- Winter- Autumn set. Love the intricate designs. 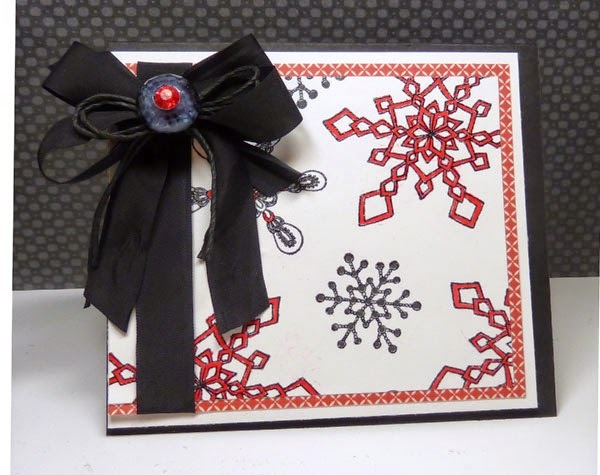 Stamped the snowflakes with with Memento Tuxedo Black and SU real red., heat embossed with clear embossing powder and the filled in the snowflakes using copics. Inside of the card. 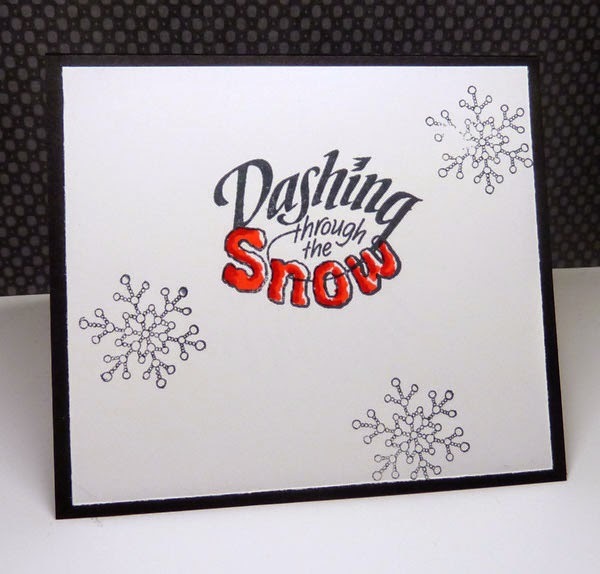 Stamped random snowflakes and added the sentiment Dashing through the Snow... shaded with copics. 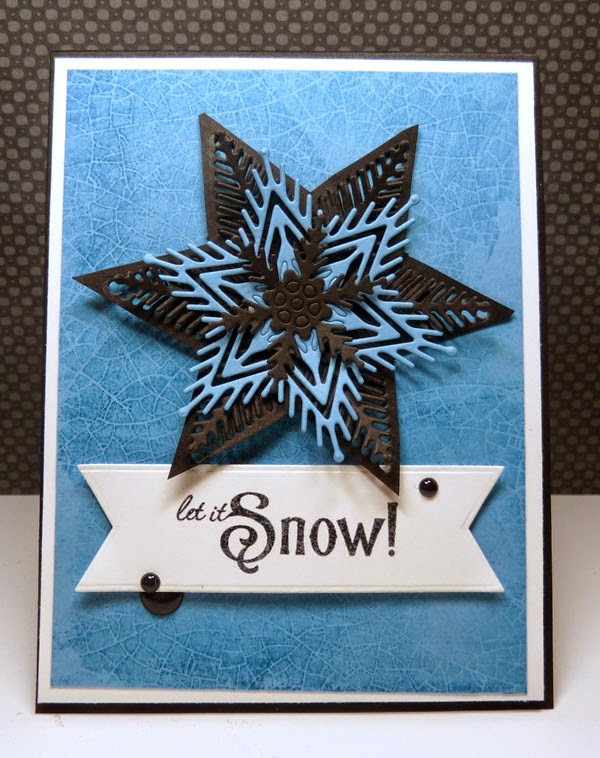 Another scene using the Snowflake stamps, stamped with Versamark onto patterned paper and heat embossed in white. Playing with the Leaf Pops Cling set and Leaf Pop dies using the branches to make a tree image. 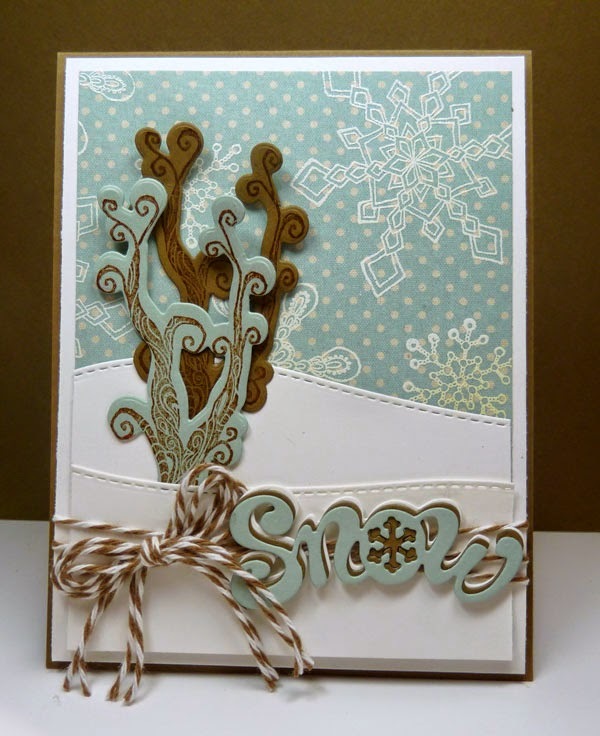 Used the the Snow die... die cut three times in white, light blue, and a soft brown- layered so the the snowflake popped with the soft brown. The snowflake cuts out separately to add the same color or make the background pop or die cut to add your own pop of color... like I did. 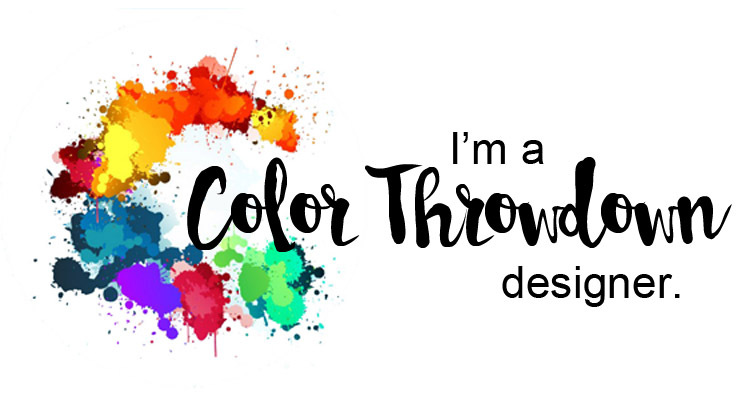 Okay now that you have seen my projects... it's time to visit all the blogs - a $20 gift certificate is up for grabs and the winner will be chosen randomly from one of the blogs. You have until Monday 10-13 to leave a comment. The winner will be posted on Marys blog on 10-14. The next stop on the hop is Jeanne. If you have gotten lost along the way, here's the full link list! Happy, Happy Wednesday!! 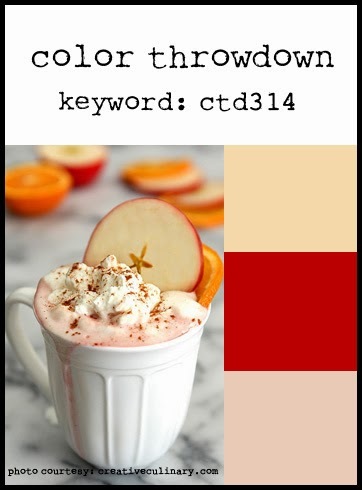 Welcome to the Color Throwdown challenge and this week's colors- brought to us by Tammy!! Gorgeous inspiration pic and perfect for this time of year!! I went a little "haywire" and did something more "springish", I'm resisting the change....love fall but, then there is WINTER, LOL!! Playing with Papertrey Ink's Doodlie Do stamp set and dies. Had planned on more stamping time this WE than I got...it was WCMD on Saturday....spent Saturday afternoon in the ER- my youngest cut her hand on a glass at work and needed a few stitches (inside and out)... always takes longer than you would wish... geesh, I'm a nurse and work at the hospital but, those dang ER waiting times are a "PIA"!! Close to the wrist and bone but, she's doing well. My orange is a bit darker in the photo than the inspiration pic but, it actually is orange. The flower was watercolored and added some Viva Decor pearl accents. Remember, if you don't have the exact colors, use whatever you have that's close...this is all about having fun! AND... remember "neutrals" are free! 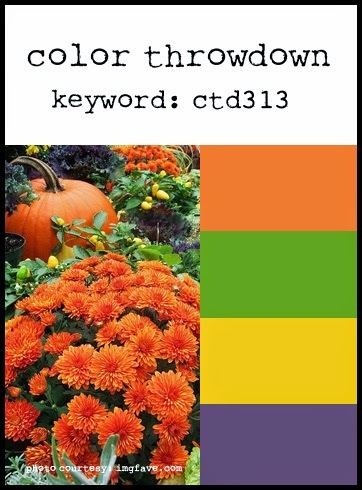 If you upload to a public gallery, please use the key words CTD313. Also, when linking up your card using the linky tool at the bottom of the post, please link to your specific post, not a generic link to your blog. Had a little time to play... not as much as I would've liked but, that's the way it is sometimes!! Taking care of kids and life takes precedence. Oh... and the kids are grown- yes, they never go away, LOL!! I have a fun little card (or at least I think so, LOL!) 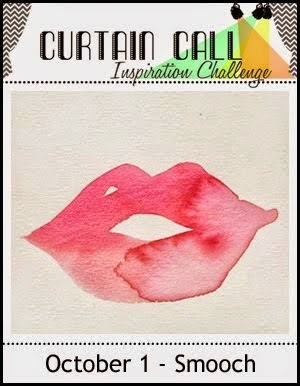 for the Curtain Call Smooch challenge using the sketch from CAS(E) this sketch.